“To support the youth bridge development and to help the youth, offering them some facilities participating the WBF events, we created a specific Youth Fund for the youth activities and in addition to the income from the Pro Youth Simultaneous Tournament, we decided to reserve to this fund a percentage of the annual profit. In Chennai we decided to create a new “Developing Fund”. The WBF Seminars represent the first action following the creation of the Fund. I hope that this initiative will be appreciated by you, reinforcing my personal feeling that this is the better way, not only to offer a support to organisation and management of the activity both of the Zones and their NBOs, but above all to work together, to exchange ideas and experiences and finally to made them full part of the WBF family. After the successful first edition held in Medellin – Colombia, 2016 – the WBF and the ABF organized the Officers’ Seminar held in Cape Town, South Africa, 3rd – 5th May 2017. The WBF organizes a Seminars Week in all Zones. The WBF will provide the format of the event, the needed documentation and the speakers. In 2019 the event reserved for the Officers of the Federations affiliated to the Asia Pacific Bridge Federation – PABF – will be organised and held in Singapore at York Hotel from 8th to 10th of June and hosted by the Singapore Contract Bridge Association, under the coordination of the APBF. Participants at the WBF Seminar, held in Cape Town – South Africa, May 2017. 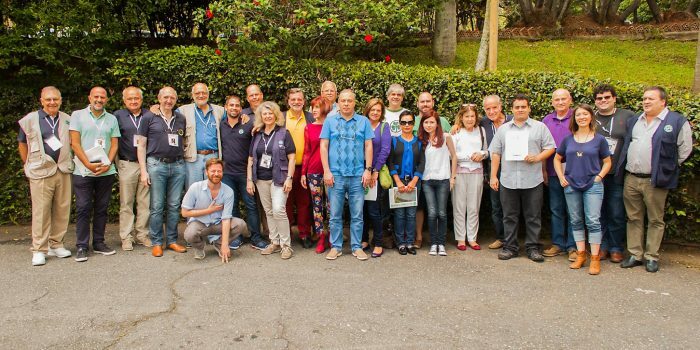 Participants at the WBF Seminar, held in Medellin – Colombia, May 2016.